Michelle Lee-Barnewall has added considerable weight to a complex and controversial divide within evangelical circles arguing that the way forward is to first step back in the gender debates. Both sides in the discussion need to get a biblical grip on the relevance of kingdom values as they relate to gender talk. I can say at the outset that this point alone got my attention and it makes the book especially important. Without this maneuver, then the ability to listen to the opposing side is significantly hindered. 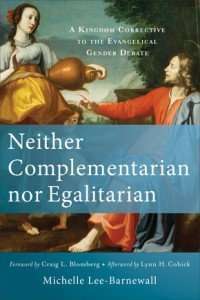 After so much heat has been generated by so many for so long, Lee-Barnewall’s Neither Complementarian nor Egalitarian: A Kingdom Corrective to the Evangelical Gender Debate is very refreshing. The first three chapters of Part 1, “Gender in Evangelical History,” set the stage for “Reframing Gender” and the final five chapters of Part 2. Lee-Barnewell’s thesis is clear and she is not taking sides. Instead, she shuffles the deck by reconfiguring the discussion in terms of kingdom values such as humility and love, unity and inclusion, sacrifice and service. She warns “when the dominant goal is to defend one’s position, it is extremely difficult to consider the possibility that answers may not lie exclusively on one side, to see the beneficial arguments on the other side, and to explore new areas” (p 3). In other words, both sides of the divide have been significantly blindsided by their own questions, which have effectively controlled the answers received. This post will briefly highlight Part 1, “Gender in Evangelical History,” chapters 1-3. A follow up post will conclude with reflections on Part 2, “Reframing Gender”. Chapter 1, “Evangelical Women and Social Reform,” was an eye-opener. A socio-historical reconnaissance of the “mid-nineteenth century to the turn of the twentieth century” in America turns up not a few “seeming contradictions,” or certainly a host of ironies, of which I was unaware. Although lines remained thick defining women and men, it was the moral roles women played that took their influence beyond the “geographical sphere” of the home. Lee-Barnewall notes that “women were domestic but not homebound. They were virtuous but not passive or fragile. They were under the authority of the men in the church and their husbands at home at the same time that they were to be moral and spiritual leaders and reformers” (p 33). As culture increasingly shifted from an agrarian society to an urban and industrial one, men busied themselves with pursuits of ambition, economics, and greed while those larger social tasks of public speaking, missions, and temperance work fell to women who were considered the moral architects of society. Fueled mainly by the suffragist movement, the world became women’s household in this early era. Chapter 2 surveys a post-World War II era showing women’s sphere of influence returned to the home as men were returning from the war in need of work and esteem. The security of the home became a safe harbor and the predominant value in America (think “American dream”). Before World War II a woman’s household was largely extended to the world. After World War II this is reversed – a woman’s world was limited to her household and it was her duty to train children and ensure her man had his place of refuge. For women to remain in the workforce after World War II was not only perceived as a direct threat to the man, but came to be viewed as a compromise of the safety and security of this most cherished institution, the American home. Moreover, it is not insignificant that “as the country turned inward during the post-World War II years and became more individualistic in its focus and values, evangelical women were primarily child centered, placed priority on their marriages over jobs, and concentrated on their own homes” (p 47). Naturally, there are byproducts of this trend toward an inward and individualistic focus. Individualism and personal fulfillment became paramount pursuits in American culture and gave rise to a new wave of secularism. Chapter 3 synthesizes much of the analyses from the first two chapters. From 1960s and onward, concerns for personal rights and equality eclipsed the good of society as a whole and became “a fertile environment for the feminists who would in turn provide a vital catalyst for the evangelical egalitarian movement” (p 49). The Civil Rights movement also served as a catalytic connection to fan the flames of a liberal feminism focused on equality of the sexes. All of these forces set the “interpretive framework” for an evangelical feminist movement that served to challenge “cultural patterns and attitudes in an unjust subordination of women” (p 57). Instead of the home being a source of women’s strength and fortitude that extended into the public arena, a post-World War II era home becomes a picture of weakness and submission, which are still heralded by complementarians as virtues but which egalitarians seek to jettison. As noted already, “a framework that is essentially decided prior to analysis, not unsurprisingly, leads to answers that fit that framework” (p 65). Questions we ask about gender roles all too often reflect “cultural rather than biblical priorities” (p 66). The more important task for both sides of the gender divide, however, is to identify those transcendent values that focus on God’s kingdom and which are more foundational. Part 2 presents the biblical reasons for utilizing “different categories with which to understand gender,” such as unity, a theology of “reversal,” and holiness of God’s people. Unless and until kingdom principles govern the discussion, the divide will only widen. Download an excerpt and see especially Scot McKnight’s keen analysis here.